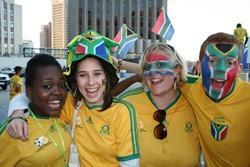 Volunteers Join the Soccer Fever in South Africa! Cape Town, South Africa is infused with World Cup fever. You can feel it everywhere in the city, with national flags flying everywhere you look. People are dressed in bright Bafana Bafana jerseys and vuvuzelas are endlessly buzzing in the background, there is a unifying energy exuding from all the excitement. It has been more then fifteen years since the inception of a democratic government and South Africa is now moving away from its painful history towards creating a nation where every citizen has access to equal opportunities regardless of their race. There is something about the world’s most prestigious soccer event that allows people to embrace the spirit of togetherness, suspending differences and social barriers that normally exist. ‘South Africans are using this World Cup as a statement to the world that they are becoming a ‘’Rainbow Nation’’ and mending the injustices of the past’, says Alyssa Myers, the Projects Abroad Desk Officer in South Africa’. Joe Crann, a Journalism volunteer in South Africa with Projects Abroad has been immersed and in the hub of all the action and he is embracing every opportunity on his placement in Cape Town. ‘I woke up on Friday morning like a 12 year old kid, no alarm needed, I was awake at 8.30am feeling the endless restless buzz that is surrounding the mother city. I would be covering the biggest game in South African History, the first game to start off the South African World Cup. The game itself was a joy to watch but I was mostly touched that I was deemed mature and responsible enough to have this responsibility bestowed upon me by my project supervisor.